Consider this: You are driving down the highway. You are cruising at a speed you think is appropriate based on where you are going, the speed limit and how much time you have to get there. Now everyone going slower than you is being ridiculous, right? There “Sunday drivers”, slow pokes. And everyone going faster than you is a crazy maniac, a speed demon, and going to get everyone killed. For most of us, the speed of our life is just right and its everyone else that is going too fast or two slow. And that is our human condition. We assume that: I am right and everyone else is wrong. We love to judge and blame others. But here the truth: we can’t blame our way to freedom. If we want freedom, then we need to stop blaming and start taking ownership. But ownership is hard. We have to learn how to take ownership. Its easy to blame. No one had to teach you that. Blame comes naturally. Just think about children. Joy Kate has been into gymnastics and that brings about bumps and bruises. But I always notice that when she gets hurt and I ask her what happens she says something like, “The balance beam made me fall.” Cause blame comes naturally. When my girls fight and someone gets hurt and we come running in to ask what happened, the first thing out of their mouths is, “She hurt me. She said something mean.” Because blame comes naturally. So, we spend time telling them to stop blaming the other and tell us what they each individually did. We have to train them to take ownership for their actions. And if they both do that, we can always work out the problem. You see, as long as they each blame the other, the fingers are always pointed away from themselves and the disagreement continues. But it is amazing that when one says, “I said something mean to her,” then the situation begins to diffuse because the other feels validated and can move on. Like children, we think we minimize our guilt by making the other person look bad. The truth is that blame puts up walls. But the thing which takes down the walls – which clears the path to freedom – is ownership, that is, taking responsibility for your life, for your situation, for your contribution to a situation. Once you begin to take responsibility for your own stuff, you earn respect from others, you are able to take steps towards changing things, and you are no longer a slave to the actions and effects of others. 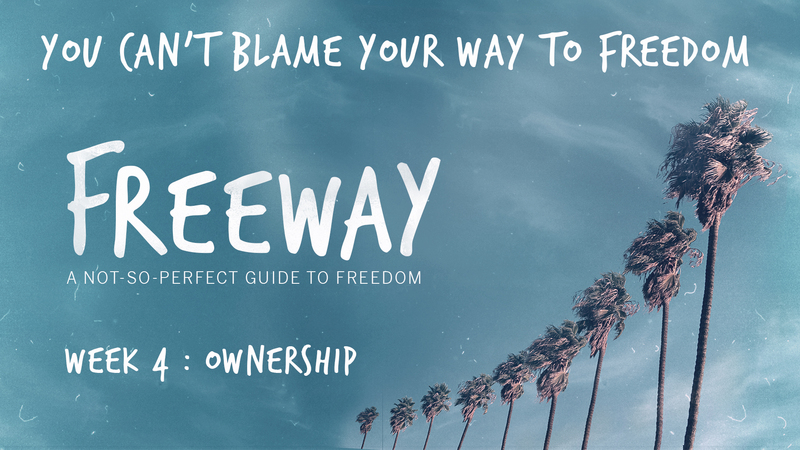 So while blame is an obstacle that comes naturally, ownership is part of the process towards freedom that we have to learn. Adam and Eve are in the garden. A serpent enters the scene and tricks Eve into eating the fruit of the Tree of knowledge. Eve gives some of the fruit to Adam, and he eats it. Then they both realize they are naked and did something wrong. So what they they do? Like anyone who has gotten in trouble, they hide. We are like Adam and Eve. We pass the buck. We point to someone else. What I am going to say here is not going to be comfortable, but we need to hear it. If we want freedom we need to hear it. If you lose something, then it’s not your fault. If you feel lonely it’s because no one will visit you. If you get angry, it’s because someone made you angry. If you’re sad, someone made you sad. If you make a mistake, it’s because someone else messed you up. Does any of this sound familiar? It should because we all do this. This is our story. And it’s a story of blame. But here is the other side of that coin: While we blame others for the bad stuff in our lives, we tend to take credit for the good stuff, that is, we blame ourselves for what goes right. If you get a promotion, it’s because you worked hard. If you get a raise, it’s because you earned it. If you win a prize, it’s because you deserved it. If you get a project done early, it’s because you found a better way. If disaster happens but you come through it unscathed, then it’s because you made good choices. If your kids do well in school, it’s because you taught them right. If the church is doing well, then it’s because of your sacrifice. If your wife is happy, it’s because you made her happy. If your husband remained calm, it’s because you kept him calm. If business is good, it’s because of your skill. If the economy is doing well, then it’s because of the candidates you voted for. If life is good, then it’s because you pulled yourself up by your bootstraps. This ought to sound familiar too. We blame ourselves, take credit for the good while we blame others for the bad. Now right here is where things get tricky because there are two things going on in some of y’all’s minds as I have been talking. Yeah, boy, people sure do need to take responsibility for their lives. Society will let them off the hook and coddle to them. But the truth is it is their fault that they’re in the situation they’re in. Now if you are thinking that, then listen up: You are doing exactly what I am suggesting you stop doing. You are blaming someone else! Blaming them for their lives. And the truth is I am asking the blame to stop. All blame. It’s not about blame. Its about you owning your stuff, your contribution, your life. Does this mean its my fault? If I take credit for the good, then I have to take credit for the bad as well? Am I the one who caused it all? Am I the one to blame for my life being the way it is? Again, I am asking you to stop all blame! Taking ownership for your life does not mean blaming yourself (especially when you weren’t the cause). The point is to stop blame! There are things in our lives that you and I did not cause. Bad stuff happens and it’s often result of things beyond our control. Here’s the truth: sometimes others really are the cause of hurt and pain. And sometimes you have done it to yourself. Likewise, when things go well, sometimes it is a result of your actions and decisions…and sometimes things go well for you because of someone else, because you got a gift, because of some silver spoon you’ve been given. But whether it’s you or me or someone else or something beyond our control, we need to stop obsessing about fault. Good or bad, it may not be my fault, but it is my responsibility! And that is what ownership is about. Not blame, but responsibility. And these are different. Responsibility – ownership – means acknowledging the situation and dealing with what is a reality today without excessive focus on whose fault it was yesterday. That does not mean denying culpability. It does not mean that we ignore fault. In many cases, we will need to admit what we and others contributed to a problem. But ownership pushes us past cause and into the things I can do to solve the problem to take a step forward towards freedom. Now in Jerusalem by the Sheep Gate there is a pool, called in Hebrew Beth-zatha, which has five porticoes. In these lay many invalids—blind, lame, and paralyzed. Keep in mind the pool was believed to have healing properties. Folks believed that when the waters stirred in the pool an angel was present and the first person to get in the water would be healed. Instead of “Yes, please heal me!” or “Yes, can you help?”, we hear a complaint. The man focuses on what’s not working and whose not helping. And this keeps him from seeing the person right in front of him offering a helping hand. Jesus said to him, “Stand up, take your mat and walk.” At once the man was made well, and he took up his mat and began to walk. Pay attention here: this man complains when Jesus makes his offer. But what does Jesus do? He heals him anyway! He doesn’t say, “You’re healed.” He just says, “Stand up” literally calling the man to take some ownership. Now the man could have responded, “Yeah, right! I can’t and that’s the whole problem.” But instead he stands. He picks up his own mat. He finally takes ownership. He deals with what is right in front of him. This story says in dramatic fashion if you want healing, then take ownership. Like this man many of us would rather be right than to get better, rather assign blame than receive healing. Let me close by explaining this one more way. Imagine that you leave church today and – God forbid – you have a car accident. You’re driving along and someone is coming at you weaving and swerving and before you can get out of the way – BAM – the driver hits you. What do you do? Who do you need? Some of you are thinking, you need the police because they will come and figure out what happened, who was right and who was wrong and get that other guy off the roads for wreckless driving or drunk driving or whatever that person was doing wrong. When an accident happens, you need police to sort it out and figure out who is at fault. Others of you aren’t thinking about police at all because you realize that if you’re in a car accident you don’t worry about who is right and who is wrong, you just need healing. You’ve been hit and you’re hurt and you need to take care of what’s broken and bleeding and life threatening. But here’ the thing: Some of you have been in serious accidents in your life and you were hurt, but you keep calling the police instead of an ambulance. Your desire to assign blame is greater than your desire to get healed. You act as if you would rather be right that be healed. We have to own our lives. We have to receive the help of friends and family who are reaching out to us. We have to take a step towards a solution. We have to make a decision that our past doesn’t define us. We have to realize that Jesus is reaching out to us right now asking us if we want to be made well, if we want healing, if we want freedom. My prayer today is that you will take Jesus’ hand, right now, and grab hold of what is right in front of you and step towards freedom.